In order to test your SKO, you must first save it. After you have saved your SKO, either locally or on our server, click on the "Run Test" tab. Clicking on the "Test SKO" button will open up a new tab in your browser. The most recently saved version of your SKO will begin to play in the new tab. Check the "Test published" box to test the published version of your SKO. To share your SKO with others, click on the "Collaborate" tab under "Script Information". Clicking on the "Share" button will open a new tab in your browser that contains the share/collaboration menu. To share authorship privileges of your SKO, type in your collaborators' gmail address in the "Invite people to your SKO" box, separated by commas. If you would like for your collaborators to be able to make edits to your SKO and delete your SKO, invite them as "owner". If you would only like your collaborators to be able to make edits to your SKO, invite them as "collaborator". 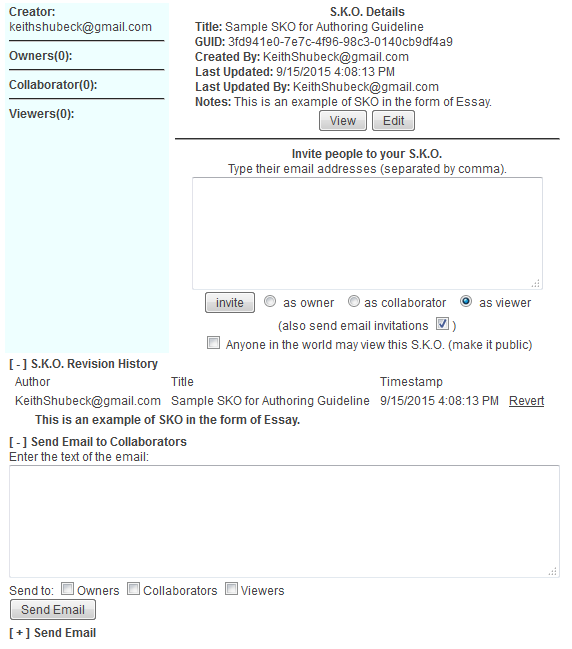 If you would only like for your collaborators to view the SKO invite them as "viewer". Notice that you can revert your SKO back to previous versions in the "SKO Revision History" menu. Click on the "Revert" button to revert the SKO to an older version. Click on the "Open SKO" tab under "Script Information" and then click on the "Open" button to view the other SKOs you have created, or other SKOs that have been shared with you.